Gastroesophageal reflux disease (GERD): is a term used to collectively describe the problems and symptoms that occur when acid from the stomach washes up into the esophagus (food tube which brings food from the mouth to the stomach). This can lead to inflammation and irritation of the lining of the esophagus as well as causing the typical symptoms that are generally associated with GERD or acid reflux. Alternate names: reflux, acid reflux, reflux esophagitis, acid regurgitation, and heartburn. Symptoms typically occur after eating a meal and can be especially noticeable with a large meal or spicy foods. Symptoms often are worse when lying flat, straining or sleeping, but may be relieved by antacids. What can worsen the symptoms of GERD? Fatty foods, chocolate, coffee, peppermint as well as alcohol and use of tobacco products can cause or worsen symptoms. Certain drugs such as Theophylline, Albuterol, and Calcium channel blockers can also cause symptoms of GERD. Are any other problems or diseases associated with GERD? Pregnancy is the most common condition associated with GERD. The pressure of the uterus on the stomach can increase the amount of acid “splashing” up into the esophagus, or the increase in GERD may be hormonally mediated. Diseases characterized by high stomach acid production as well as connective tissue disorders (i.e. scleroderma) are also frequently associated with GERD. Obesity which causes an increase in abdominal pressure is also thought to contribute to and worsen acid reflux. The Esophagus leaves the chest and enters the abdomen through an opening call the diaphragmatic hiatus. Muscular fibers (called crura)of the diaphragm wrap around the esophagus as it passes into the abdomen. When the crura are loose or lax , the stomach can “slip” or “slide” through up into the chest. This is called a hiatal hernia and may contribute to reflux symptoms. An abnormally wide angle of His (the angle between the esophagus and stomach) may lead to an “upside down funnel” which can also anatomically contribute to GERD. There is normally a physiologic sphincter (a “gate”) between the esophagus and stomach called the LES (lower esophageal sphincter) which serves as a barrier and protects the esophagus from acid. The sphincter cannot be seen. It is simply a high pressure zone at the bottom of the esophagus which keeps gastric contents out. Normally, the lining of the esophagus and stomach are made of different types of cells. The cells which line the esophagus are not as resistant to acid as the cells which line the stomach. This can lead to esophagitis. What is the actual causes GERD? Inadequate saliva production – seen in smokers, in certain diseases and normally seen during sleep. Saliva normally “buffers” any acid which is found in the esophagus. Impaired resistance of esophageal lining – defective protection of the esophagus against acid by the cells which make up the lining of the esophagus. LES dysfunction – poorly functioning sphincter muscle (gate between stomach and esophagus) allowing acid to wash up into the esophagus. Delayed emptying of the stomach – poor motor function of the stomach (not draining into the intestine) allowing acid to “pool” in the stomach. Reflux esophagitis (irritation, injury and inflammation of the esophagus) caused by prolonged exposure to acid and or bile. This may produces pain as well. Unfortunately, reflux esophagitis can progress to Barrett’s esophagus (pre-cancer),stricture, or esophageal cancer later in life. How many people suffer from GERD? It is one of the most common conditions affecting the gastrointestinal system. Anywhere from 36-77% of people have symptoms of GERD (heartburn, regurgitation of acid etc.) spread equally between men and women. How do you get GERD? Diet, smoking, obesity, alcohol, pregnancy, hiatal hernia, can all contribute to GERD. Other gastrointestinal disease (Crohn’s, Esophageal atresia, others) may also be a factor. No one single factor that has been identified as the “cause” of this disease. 24 hour pH probe is the gold standard test. Upper GI radiologic studies, upper endoscopy (called an EGD), and Esophageal Manometry (measures the motility of the esophagus and the sphincter pressure via a probe placed into the esophagus) are useful adjunct tests. Non-prescription therapy is often enough. Examples include ranitidine and omeprazole. Ranitide or other H2 Blockers may be used to treat the symptoms of GERD. Metaclopramide is often prescribed to improve gastric emptying, but effectiveness is questionable. Next line is proton pump inhibitor (PPI) such as Prilosec, Protonix, Nexium, Aciphex, or Prevacid will most likely be used. What are my options other than medicines? Stretta (Radio Frequency) treatments EndoCinch (endolumenal procedure to prevent reflux) – Initially have shown encouraging results, long-term results are unclear at this time. Thal – partial wrap. Less commonly used now. 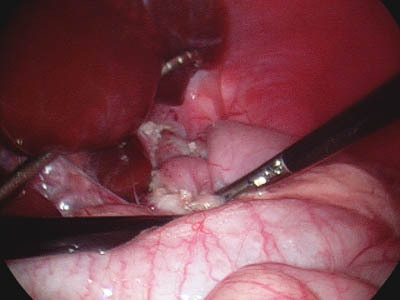 Laparoscopic fundoplication has been shown to provide excellent/good results in 90% of neurologically normal children. Results for neurologically impaired children are not as good. What are the diet restrictions? A post-fundoplication diet or Post-Nissen Diet is recommended. Do you do this surgery often? Not as often as we used to. In the early 2000’s we would do this procedure on almost every developmentally delayed patient who aspirated and had GE reflux. Now we only do it on children that can’t be managed medically and are not a candidate for continuous GJ tube feeds. All of the surgeons to many laparoscopic GI surgeries, so feel confident that your surgeon can do a laparoscopic fundoplication. All of our surgeons are fellowship-trained and either board certified or board-eligible in pediatric surgery. What is the success rate of this surgery/ How well will it work? It really depends on the patient and their symptoms. National statistics suggest 70% do well enough to come off meds, 20% still need meds but are much improved, and 10% are not improved. GE Reflux is not the same as vomiting. Reflux is a low-pressure movement of stomach contents into the esophagus. Vomiting is a high pressure, coordinated brain process that involves abdominal muscles as well as the stomach. What is a hiatal hernia and is the patient more likely to get one after procedure?The â€œhiatusâ€ is the normal opening of the diaphragm. The esophagus leaves the chest and enters the abdomen through the hiatus. A hiatal hernia is when the stomach comes up into the chest through that opening. 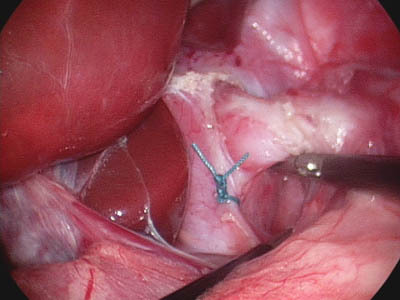 It is possible to develop a hiatal hernia after the surgery, but less common with the recent modifications (not freeing the front of the esophagus). Can the fundo come undone or rip? How likely? It is rare for the fundoplication to become completely undo. Often, over time it can become less effective, however. This is usually due to stretching of the wrap over time, making it less effective. Development of a hiatial hernia can also lessen the effectiveness of the wrap. As patient grows will the fundo stretch? In some patients, the fundo works perfectly forever, but in others, they have return of symptoms. Patients who gag and wretch (dry vomit) seem to have more problems with failure than those that don’t. The best sources of detailed information on GERD in children are NASPGHAN and APSA and the “Pediatric Gastroesophageal Reflux Clinical Practice Guidelines: Joint Recommendations of NASPGHAN and ESPGHAN” which should be published soon.